Stop building things from scratch. Use templates to create marketing assets in less time and at a lower cost. Let me know if this sounds familiar: You are staring at a blank page, and you are about to spend a long afternoon creating some novel marketing asset from scratch. Let’s say that you are in charge of writing up a series of new transactional emails for your company. You could spend half the afternoon reading blog posts about best practices for transactional email. Or, you could just wing it and hope for the best! Here is the beauty of using a template instead of either of those strategies: you can instantly start building upon the knowledge of experts. If we are talking about transactional email, guess what? There are consultants that get paid hundreds of thousands of dollars and share their most successful work online. 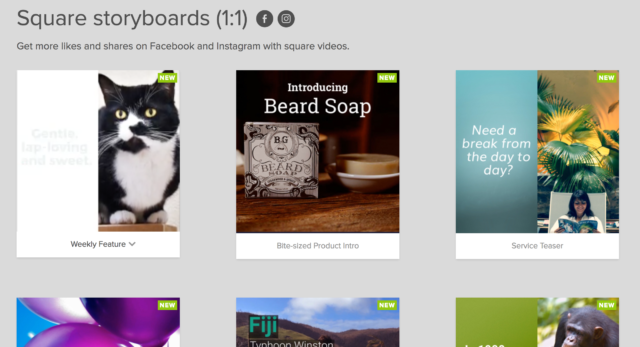 There are companies that curate the best examples from their user base and offer it for free. So, we collected a series of template galleries where experts post their best work, or curate the popular work from others. To be clear, a template is pre-made skeleton for a complete marketing asset. All you need to do is plug in information about your specific business. As a 3-time startup marketer, I have had to figure out how to build all kinds of marketing assets. Templates have saved me many times. Below is my list of reputable sources of digital marketing templates. As you might imagine, every marketer marketing to marketers in the known universe has posted marketing templates on the Internet behind a lead capture form. Instead, I mostly focused on free services that provide templates. Focus: The template library must have some consistency. It can’t just be a dumping ground for 10 different templates that the business has shared over the past year. Focus proves that the business or curator spent time on putting together the resource in a cohesive manner. Quality Metric: I looked for some social proof that past users had enjoyed the templates. Potential metrics include backlinks, number of users and reputation in a niche community of experts. Steps Required To Use: All the templates are free to use. Some require you to share your email or set up a free account. Focus: Databox allows you to analyze your metrics from 50+ digital services without touching spreadsheets or screenshots. The gallery contains templates submitted by our expert digital marketing partners on specific topics like email, e-commerce, landing pages and many more. 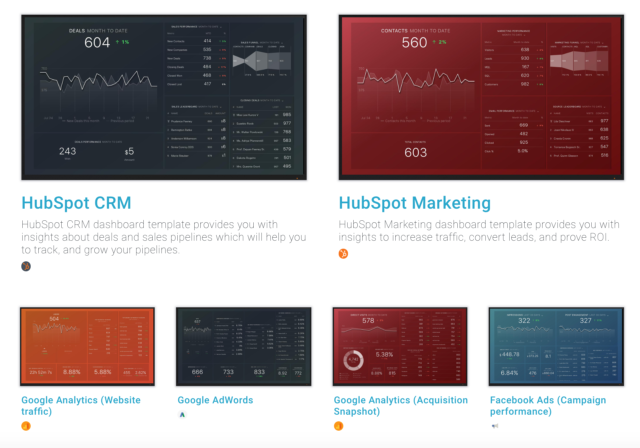 Databox automatically pulls data from popular marketing tech like HubSpot, Google Analytics, Facebook Ads etc. How I Know It Is Good: Databox’s templates have been used thousands of times as of August 2017 (I looked at our metrics!). Templates have made it easy for more than 1300 HubSpot partners and customers to start using us, making us a Premier HubSpot Connect partner. Steps Required To Use: You need a free Databox account in order to use templates. Once you have an account, you can use up to 3 templates for free. How I Know It Is Good: According to HubSpot, these templates have been downloaded 35,000 times! Steps Required To Use: Just enter your email into the form. Focus: You can track pretty much ANYTHING in Google Analytics, as long as you know how to set up goal conversions. E-commerce, social media, e-mail, lead generation — you can find a way to do it. 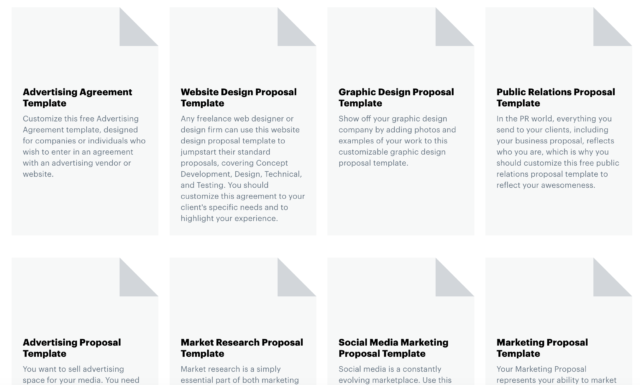 The Solutions Gallery is full of templates submitted by the world’s top digital marketing experts. You can choose a holistic dashboard, or a specific one. It only requires that you have a Google Analytics account. How I Know It Is Good: The top 20 reports have been downloaded over 500,000 times in total. 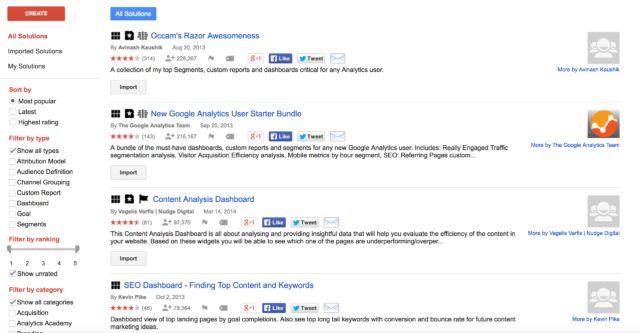 Steps Required To Use: Just need Google Analytics on your site. If you’re a Databox user already, here are the ten most popular Google Analytics dashboards recreated in Databox. Focus: As you might imagine, Really Good Emails covers MANY different types of emails. But, it mainly focuses on e-commerce and transactional emails. Transactional emails are the ones that get sent when a user triggers a specific event on an app or website. 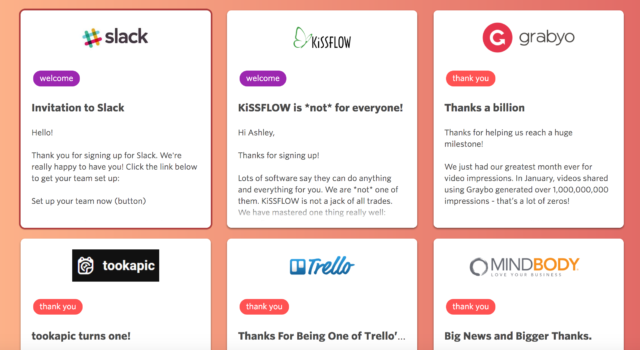 Really Good Emails is curated by a proud group of email nerds. The 5 people who manage the site have curated every single email on the list. How I Know It Is Good: First of all, you rarely come across this level of passion for email. Second of all, they have managed to accumulate almost 4000 backlinks and 16,000 monthly organic visitors, according to SEMrush. They have established themselves as an authority on email marketing. Steps Required To Use: It’s all instantly available. You can sign up for their email newsletter if you want to learn about the latest trends. Focus: Joanna Wiebe is one of the top copywriters in the world today. Her new product, Airstory, allows sales and marketing teams to write copy collaboratively. Joanna specializes in landing page copy and plain-text emails, and she has added a series of templates based on her past consulting work. How I Know It Is Good: Joanna runs the Copyhackers blog, a popular copywriting blog for tech companies. She has driven millions of dollars of revenue for SaaS companies through her consulting work. She runs weekly webinars where she explains how to come up with new copy ideas and integrate them into her templates. Steps Required To Use: Although AirStory does not have a free plan, it does have a free 14-day trial. So you can sign up for a trial and grab the templates. Focus: Does carefully drafted email copy get you pumped up? Yes? Then this is the template directory for you. Good Email Copy focuses specifically on transactional email. It has examples for every minor email that your business could send. How I Know It Is Good: Good Email Copy has received almost 5000 upvotes on Product Hunt, more than any other email marketing template directory. Steps Required To Use: None. Just copy your favorite email from the page. Focus: HubSpot popularized the lead generation strategy of creating landing pages with offers in order to convert visitors. These 13 Ebook templates allow you to start with a full design so you can focus on writing compelling content. How I Know It Is Good: Since HubSpot basically invented this strategy, I feel pretty confident in recommending their design assets. Their templates have been downloaded tens of thousands of times. Steps Required To Use: Enter your email into the form and you can download immediately. Focus: PandaDoc’s proposal library helps freelancers, consultants and agencies who want to keep all their proposal data organized. It provides beautiful templates that will represent your brand. How I Know It Is Good: PandaDoc has 7000 paying customers (source). Steps Required To Use: You can use their 14-day free trial to create the proposals you need. Focus: Beacon is an easy tool for creating marketing offers. Their template pack covers the full range of digital marketing offers- eBooks, checklists and guides. All of the PDFs included can be edited within Beacon. How I Know It Is Good: Beacon has been recommended by the most tech-savvy agencies in the Databox community. Steps Required To Use: Just need a free Beacon account. Focus: Animoto allows you to combine music, photo and video into engaging presentations or pieces of social media content. Their Storyboard library helps automate one of the most time-consuming parts of making a video: storyboarding! You only need to substitute in your photos, videos and text, and you will have a full video. How I Know It Is Good: Animoto has over 6 million users that utilize its tool instead of trying other hacky ways of making video or hiring a videographer. It has been around for 11 years. Steps Required To Use: Animoto has a 14-day free trial, so you can create as many videos as possible within 14 days. Focus: Biteable specializes in animated video. It covers a wide range of videos, from sales to YouTube-oriented to explainer videos. How I Know It Is Good: Biteable receives over 60,000 monthly organic visitors and has accumulated 6500 backlinks, according to SEMrush. Steps Required To Use: Just create a free account on Biteable. Focus: Rather than prepare templates for entire videos, Renderforest specialized in short, high-quality animations. These could be used at the start of a video marketing campaign or presentation, for example. You can use their detailed animations within other video creation tools. How I Know It Is Good: Over 50,000 users have created over 100,000 videos on RenderForest (source). Steps Required To Use: Just need a free Renderforest account. Focus: Videobolt bases their entire UI around the template concept. 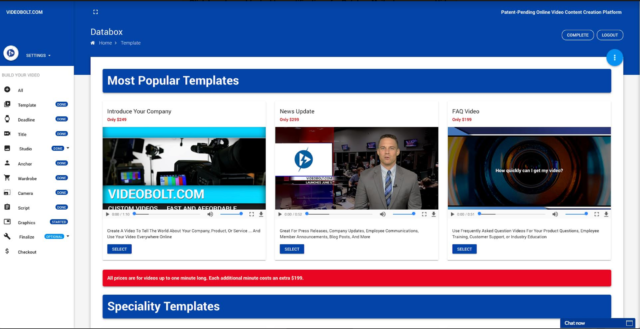 Rather than storyboarding, scripting and producing a video from scratch, VideoBolt offers a few high-level templates like News Update, Company Intro and FAQ Video. Then, you can customize each piece so that the video fits your brand. All are human-centric rather than animated. Steps Required To Use: Videobolt allows you to create one video with the FAQ template for free. If you login to http://videobolt.com/ and select FAQ Video, then click on the Checkout page, you can enter promo code DATABOX. Once you do that, the payment button is replaced with a “Send to Production” button. Users who order a free FAQ video with promo code DATABOX will not need to enter any payment information. Focus: Canva has many types of design templates in its gallery. I chose to include their marketing presentation templates since pretty much every marketer needs to create well-designed presentations. How I Know It Is Good: Canva is an exceptionally popular design tool, with over 10 million users across the world. Their full template gallery has 10,000+ templates. Steps Required To Use: No sign-up needed. You will probably want to use the Canva editor to create your slides, but you can also download them and use them in Powerpoint. Canva has a free plan if needed. Focus: Adioma uses its popular flat design style and color palette in these downloadable templates. Their full tool is an infographic designer, so they specialize in finding clever ways to represent data. How I Know It Is Good: Anna Vitals, the founder of Adioma, gathered 77,000 email sign-ups using these templates and a clever growth hack. Her popular infographics have earned millions of views over the last 5 years. Steps Required To Use: Just need to share an e-mail address and you will receive a .zip file in your inbox. Focus: Slides Carnival is a project from Jimena Catalina, a veteran designer based in Madrid. The templates are organized by level of formality, from playful to business. Each presentation tone could be appropriate for a number of occasions. How I Know It Is Good: According to SEMrush, the site receives an astounding 135,000 monthly visitors and has earned 2000 backlinks. Steps Required To Use: None. Just find a template you like and download. Nowadays, there are templates for pretty much any marketing task you need to complete. Are you an expert in the subject? If you are an expert, then you may actually dilute your personal or company brand by choosing a template. Let’s say you are an authority on promotional videos. You do pricey work for demanding clients. You probably don’t want to use a template, because you risk commoditizing your product or service. If you are an expert, your work should be obviously better than anything that an average marketer could create with a template. 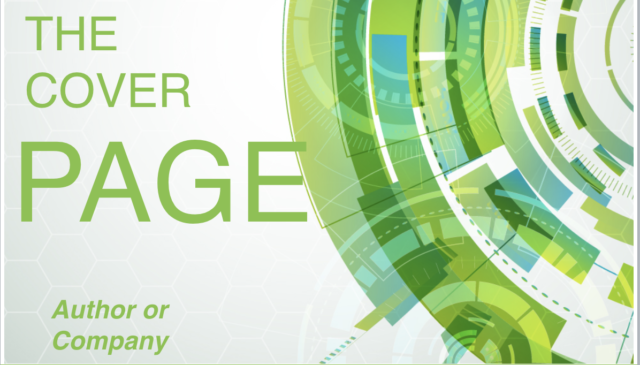 Is this marketing part of your company’s core value proposition to customers? If the work is part of your company’s core value, you also may want to avoid a template. So, if you are a consultant that does branding for healthcare clients, you probably do not want to search for healthcare email marketing templates and common e-book designs. Anybody could grab those templates and use them for free! Your work should go above and beyond. When should you use a template? Use a template for any work that is not core to your value. For example, if you’re a marketer marketing a local contracting service to homeowners, using a template makes a whole lotta sense versus hiring a designer to do custom work for you. Templates will save you a lot of money and time. If you run a digital marketing agency, your monthly reports are probably not part of your main value proposition either. Actual marketing services are your core value. 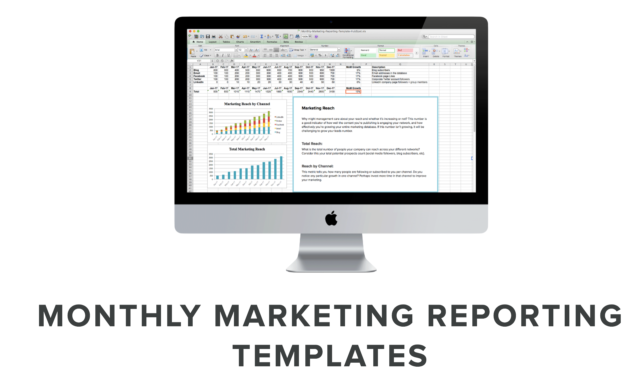 So, you should start using reporting templates to eliminate all the time-consuming parts of monthly reporting.